Digital display technology has improved and evolved drastically. Display manufacturers are trying to manufacture screens that are not only economical and durable but also provide best viewing experience. If we look around, we will find that most of the electronic devices which we use have screen types LCD, LED or CRT screen. But the basic problem with these is that either they consume huge power or their display quality is poor. To overcome these problems, a new kind of display screens are manufactured which have low power consumption and good brightness level. 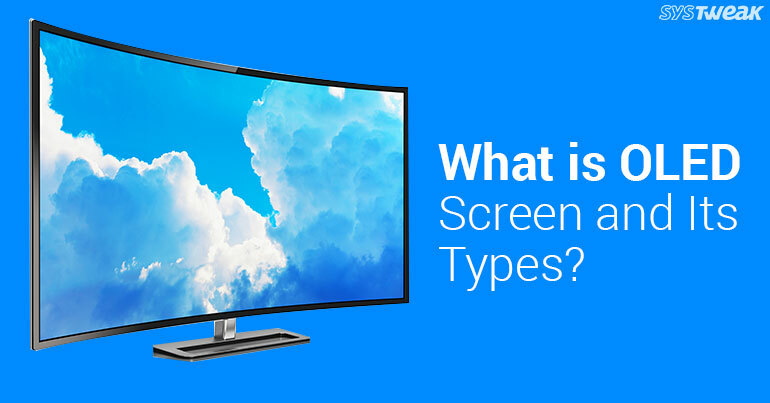 These display screens are known as OLED display. So, let’s know more about this display below. OLED is basically a type of display which is still in development phase. This technology was firstly implemented by Kodak researchers in 1987. Its structure is made of thin light emitting organic LED films which creates good brightness while using less energy than present LED screen. Since these LED films are made of hydrocarbon chains instead of heavy metals, hence ‘Organic’ word is used. As OLED itself produces light, it does not require any backlight and other filtering systems which are essential for LCDs. Due to this benefit OLED can be made transparent and flexible with best possible picture quality. It is also known as Active-Matrix OLED, here active matrix is related to the driving electronics i.e. TFT layer. Normally when an image is displayed then it is the pixels which display it line by line (sequentially), because only one line can change at a time. If we talk about AMOLED it maintains the line pixel states because it uses a TFT which contains a storage capacitor. This also helps AMOLED to enable large resolution displays. It is known as Passive-Matrix OLED. Here passive matrix means a way by which you can drive the display. It uses a simple control procedure in which you control every line of display in sequential manner. PMOLED electronics do not contain a storage capacitor so maximum time the pixels of each line are off. Therefore, to come out of this more voltage is required to make them brighter. In this way though PMOLED is easy and economical to fabricate but less efficient and durable as compared to AMOLED. Also, it has restrictions on display size. Lower Power consumption: As compared to other displays like LCD, OLEDs are less power consuming as they are not driven by any backlight panel. Durable and lighter: OLED is more durable than other display types as it is independent of additional display component. This also makes it lighter in weight. Good picture quality: As OLED is self-light emitting display, it is not only brighter but also has good refreshing rate as compared to the LED/LED panels. Companies like Samsung and LG are using this technology in their products like android devices and TVs. At present, OLEDs are still going through refinements to achieve best quality pictures. Also, there are some issues with displaying some specific color like blue that requires additional electronic arrangements to get the products ready. However, very soon it will get done and you will have the best quality display which will be more flexible and durable. Next Read: Mobile Botnets: They’re Coming For You!